We did, indeed, have our forecasted white Christmas. And it hasn’t stopped snowing yet. Here are a few images we took yesterday (by “we”, I mean Ethan and I; he stayed the night). Our back yard. It doesn’t look quite the same this morning as the kids played back there later in the day. And there’s more snow there now. My car, before Ethan and I cleaned it off. There’s about 8″ of snow on there. We used a broom to clear it off and, even so, it took nearly half an hour to clear off the car and the snow immediately around the car! My helper. The two things they forgot to bring were his snow pants and his boots. He definitely had fun, though. He did have mittens but when you’re playing with a remote control car (all weather vehicle), mittens just don’t work! The guys who belong to the trucks cleared the driveway for us, thankfully. John was under the weather and barely got out of bed all day. Charlie was having a blast, looking for her (imaginary) ball. Time certainly flies when there’s much to do. It’s almost Christmas already. Here, in the house, you’d never know. The only decorations up are the Christmas cards that have been trickling in and the giant 3D snowflake Trinity made for us. While the kids were here yesterday, we made a batch of sugar cookies; Ethan was more interested in breaking eggs and adding ingredients while Trinity was most helpful when it came to rolling out the dough and cutting it with cookie cutters. We embellished them very simply with some coarse vanilla sugar. When they left, I gave Kristen a small tin of cookies and kept a small tin for ourselves. Today, I’ll be baking up a couple of very Dutch recipes, speculaas squares and koek, a spiced loaf cake. If you’re interested, you can find the recipe on my cooking blog (also sorely neglected), In Ev’s Kitchen. We’ve decided to go completely non-traditional with this year’s Christmas dinner. When I asked Kristen what we should have, and suggested turkey, she nixxed the idea right away. Between the three of us, Kristen, John, and myself, we decided to have a prime rib roast with Yorkshire puddings and a variety of vegetables. No stuffing, unfortunately. That’s my favourite part of Christmas dinner. Yorkies make up for it a little bit, I suppose. They’re definitely a favourite around here. As for Christmas day, the weather man has guaranteed that we’ll be having a white Christmas this year. There’s snow on the ground now, with light snow falling. To all of my family and friends, I hope you have a wonder-full, safe Christmas and I wish you a happy and prosperous 2016. It seems that summer has taken its leave. The weather has suddenly turned cooler and wetter. That’s very good news for the British Columbia/Washington State fire situation; if I’m not mistaken, all of the fires burning around here are now under control and a campfire ban has been lifted. Our skies are clear of smoke; they’re not clear, though. It’s still overcast but it’s regular clouds, rain clouds, not smoke. 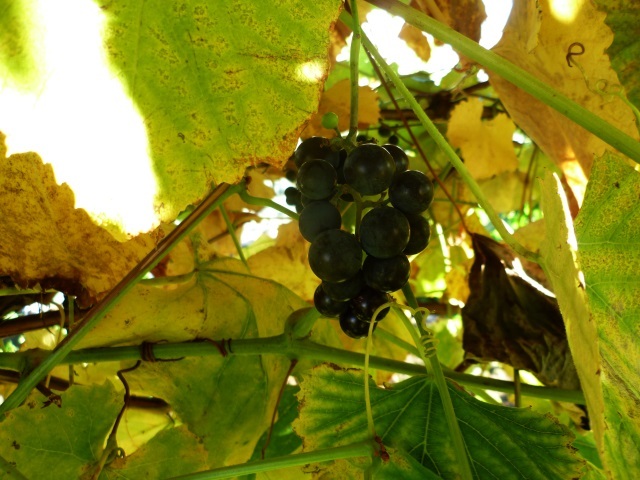 This doesn’t mean winter’s on its way yet; September and October can still be very warm around here; it does mean that autumn crops are coming on strong! Apparently, the farmers growing pumpkins have them ripening far ahead of their usual season. Around here, life is interesting. There have been a few changes around the yard, nothing I need to share but it is definitely more quiet (a welcome change, to be sure) around here. Trinity and Ethan were here last night while Mom had a much needed night off. They’ve been (and are) outside with their roller blades, trying not to fall, and avoiding the rough patches on the road (we live on a fairly quiet street so I’m not worried). So far, there have been a few tears but no major injuries, thankfully. 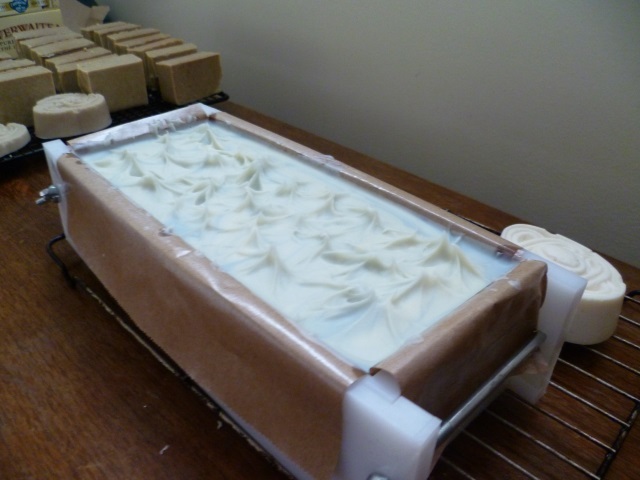 One of my co-workers let me know this week that I’ve become obsessed with soap making; you know what? She’s right. I made another batch before I left for work yesterday, in addition to the batch I’d already made this week. This is a soap from Anne L. Watson’s lovely little book “Milk Soapmaking”, which was available on Amazon at no charge. As the name of the soap suggests, it’s made with yogurt! I’m surprised at the array of ingredients that can be used in making soap. 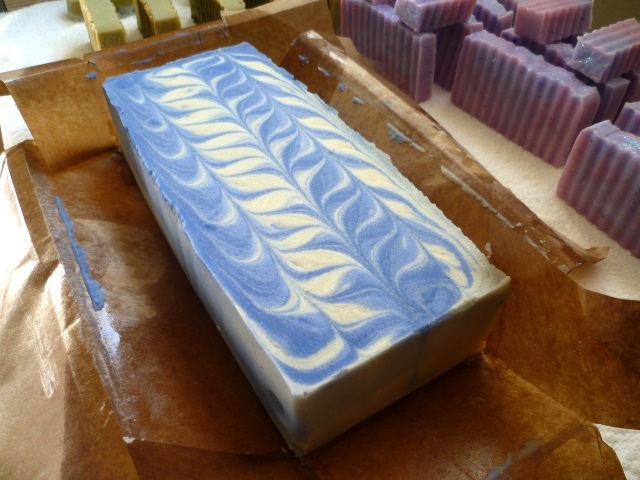 I wanted to be able to tell, at a glance, which soap is which, so I coloured this one with some blue colorant that I still had from my lotions and potions making days. 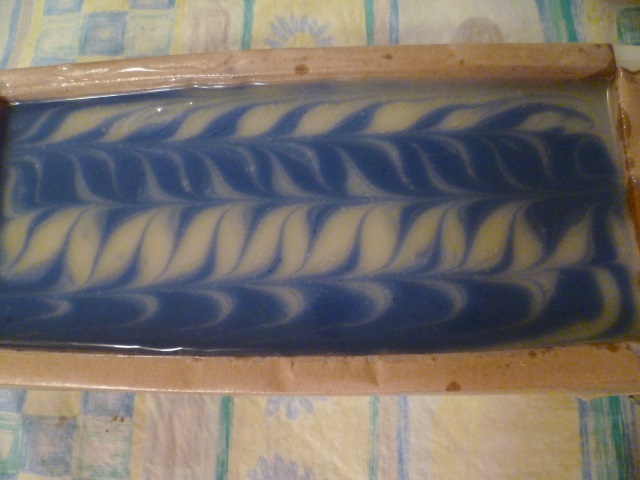 I didn’t want a solid colour so I mixed some of the colorant with a bit of the oil and coloured half the soap batter, which I then swirled back into the uncoloured mixture before pouring into the mold. I love the result. This one has also been scented. In this case, I used a blend that I’ve used in the past as part of a muscle rub – equal parts of ginger, juniper, rosemary, and peppermint essential oils. Now that it’s curing, the scent is amazing; the peppermint is definitely there and the remainder blend very nicely with the mint, making it an almost masculine scent. 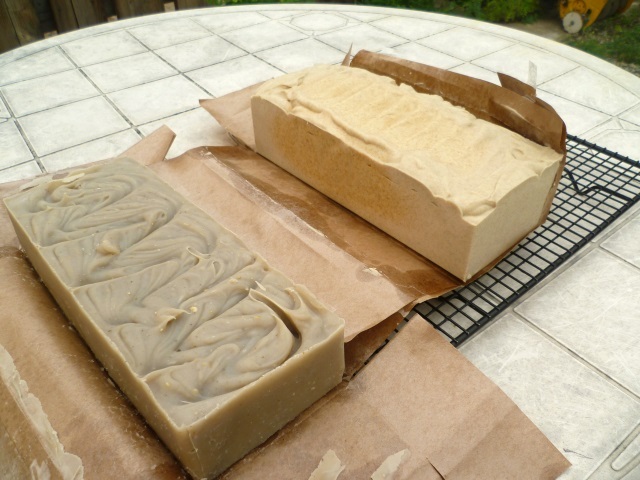 The one I made yesterday is also from one of Anne L. Watson’s books, “Smart Soapmaking” (also free on Amazon). This one is the Almond Facial soap, made only with liquid oils (just how many people do you know who just happen to have fractionated coconut oil lying around?). I wasn’t sure what colour to make it because, again, I want to be able to tell at a glance which is which, and decided on pink and purple, simply because those are the other two colorants I have on hand. 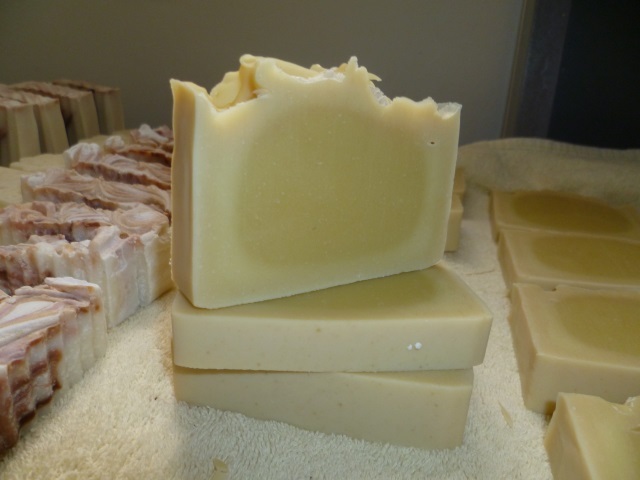 This soap took a lot longer to solidify than any of the soaps I’ve made so far; I think it’s because of the fact that there are no solid oils (fats or butters) in it. The colours are amazing and it makes me think of a mermaid’s tail, with the swirling pinks and purples that Trinity loves so much. Because the soap is still a touch sticky on the top, I decided to take it a step further. Another item I have left from my lotion making days is some opalescent cosmetic grade glitter, very fine, very sparkly, and very Trinity! Before I let her cut it, I sprinkled some of the glitter on the soap and we now call it Mermaid Soap. The wavy cutter only adds to the mermaid feel, don’t you think? 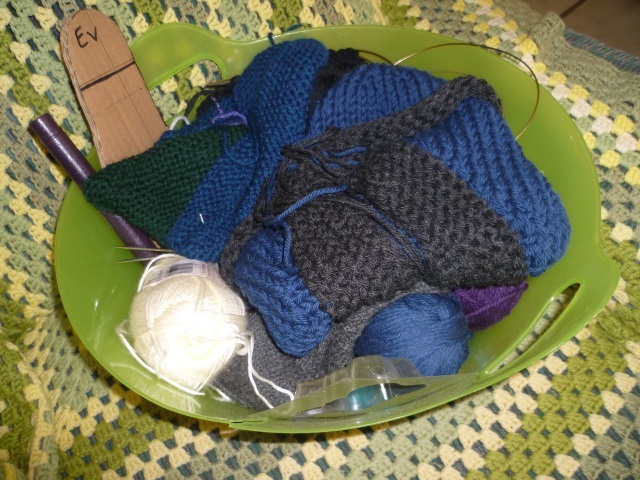 As for my knitting, the face cloth is about two inches from being finished. I’m hoping to have it finished this weekend but we’ll be taking Kristen and the kids to the I.P.E. That stands for Interior Provincial Exhibition, the longest running exhibition in British Columbia. That will take care of tomorrow. Monday is Labour Day, though, and I’m off; perhaps I’ll have time to finish it then… and immediately cast on for another one. Now, I’m rambling so I’d best go finish up the breakfast dishes and get this day going. Happy Labo(u)r Day to all! We woke up to a very smoky sky here in Kelowna. From my reading online, a lot of people were under the, thankfully, mistaken impression that Kelowna was on fire. As I say, thankfully there are no fires within our immediate vicinity. 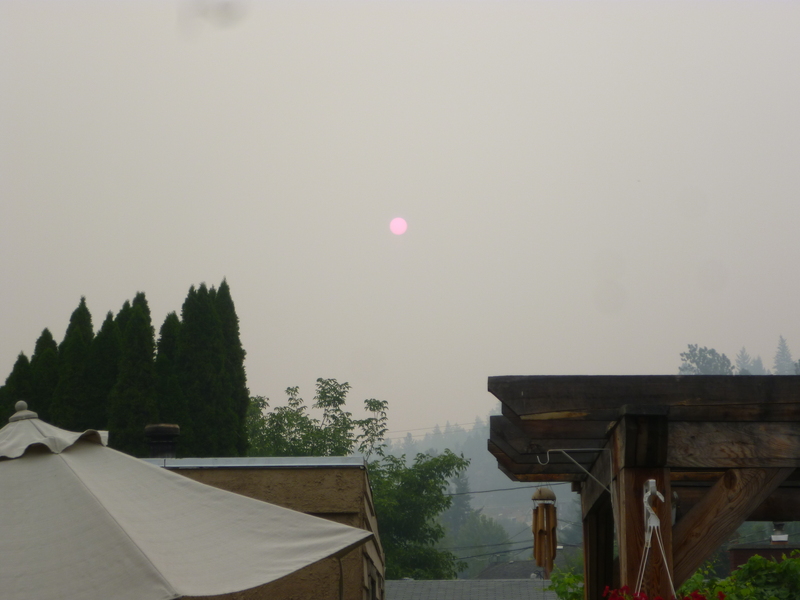 Unfortunately, the smoke is coming from the Stickpin fire, burning across the border in Washington state. That fire is now threatening to move into BC and it’s being watched carefully by both British Columbia and Washington State fire officials. This picture doesn’t quite capture the redness of the sun. It was quite the surprise to step outside and see a red sun up in the sky. We were even able to look at it with binoculars and could very clearly see solar flares on the sun’s surface. It was a truly unique experience. How often do you get to look directly at the sun and not hurt your eye? The smoke, however, is extremely unpleasant. The radio has been warning that outdoor activities should be limited while the air is as smoky as it is. To be honest, it’s affecting me a little; my nasal passages are stinging and… it stinks! 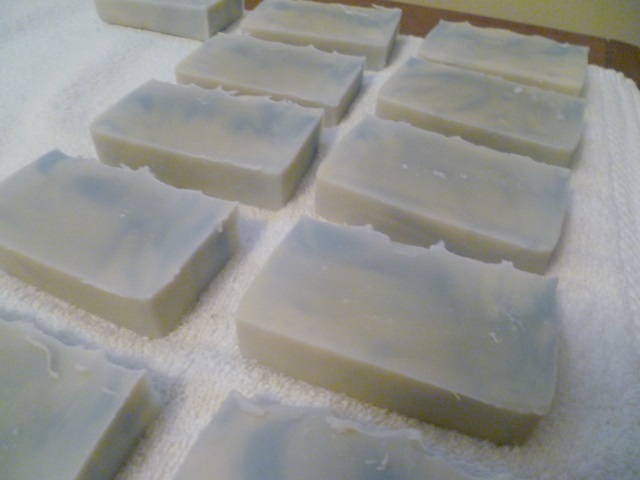 My soap making adventures are continuing and, I have to tell you, it’s almost addicting. Once you’ve made one batch, you start looking at recipes and wonder what this recipe would be like, or that one…. That’s exactly what’s been happening. After last week’s three batches, I’ve made another two batches this week. The first batch I made yesterday is a bit of a riff on a recipe I found online. It’s a shaving soap for the men (and possibly the women) in my life (not that there are a lot of them.. men, that is). It’s based on this recipe. I didn’t have all of the oils in the recipe and I certainly didn’t want to make 5 lbs of shaving soap. That’s a lot of soap! Using a lye calculator I found online, I altered the recipe to make a smaller (approximately 2 lbs) batch using ingredients I had on hand. I only had to buy a pound of shortening (which includes palm oil and can be substituted 1:1 for said oil). In the photo, it’s the loaf of soap in the foreground. It’s a little on the dark side right now but as it cures, it will become lighter, like the bits stuck on the paper in the extreme foreground. The second loaf of soap is one that I’ve been wanting to make since I first came across the recipe on Pinterest. 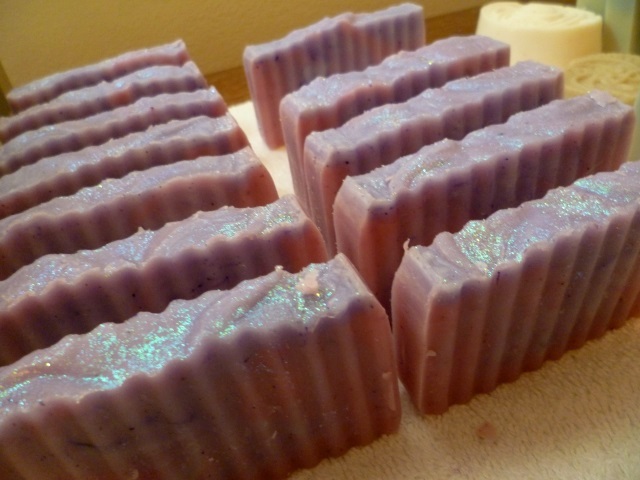 The recipe is Nana’s Lavender Goatmilk Soap and it smells amazing! Even though I made this loaf about eight hours after the shave soap, it’s already much harder. I have a feeling this will be a hard, long lasting soap. It, too, should lighten up quite a bit with drying. If you read the recipe at all, you’ll see that it contains powdered lavender flowers in addition to lavender oil. I just happened to have some of that, left over from my cream and lotion making days. It’s nice to be able to use up some of the stuff I still have on hand. This morning, I cut both loaves into bars… 9 of each; each loaf measures 8.75″ and I cut them into 1″ bars, leaving one slightly smaller bar. 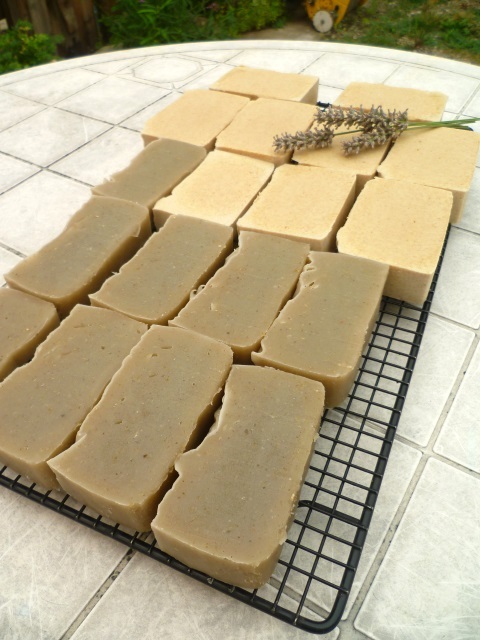 I’m even thinking of cutting some of the Lavender Goatmilk bars in half as they’re fairly large bars. It might help make the soap last a little longer, too, although that could just be perception. Now, there’s just one more soap I’d like to try. 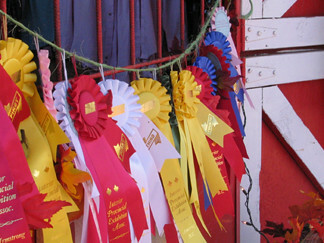 This one, which is also the featured image for this post. Can you imagine the scent? Coffee, along with ginger, cinnamon, clove, patchouli, and sweet orange?? It would be like chai meets breakfast (coffee and orange juice?)! 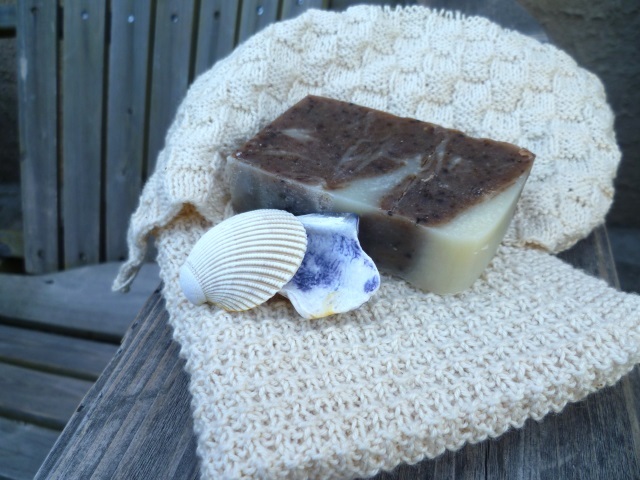 The coffee grounds in the soap help to provide exfoliation and/or scent removal (garlic? fish?) in the kitchen. And it looks like a fun technique. Maybe next week. 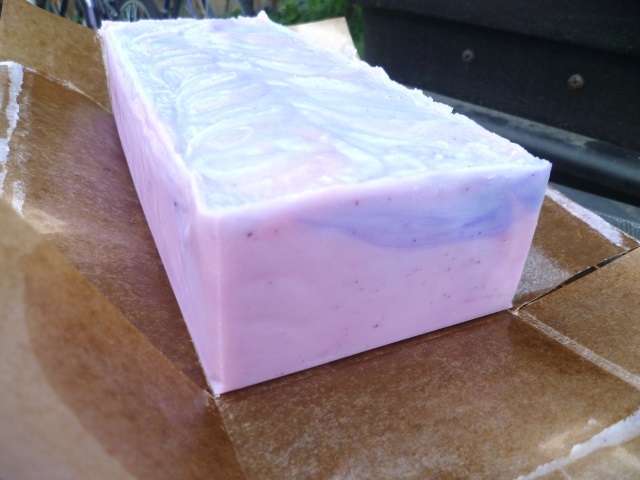 Edited to add: I did make the Java Jumpstart Soap this afternoon. Tomorrow, I’ll have an idea of how it turned out. It’s my very first attempt at mixing colours. For now, my soaping has come to a halt (we’ll see how long THAT lasts! ); I probably have enough soap to last me the rest of my life even though a few bars have already been earmarked as gifts for family members and friends. In the comments on last week’s post, I asked if anyone knew where I might be able to find lye (not that I’ll need any more for a long time); after phoning my local Home Hardware store, I found out that they carry it (in Aisle 5, thank you very much). Question asked and answered. Coincidentally, had I really looked at the container my mother gave me so many years ago, I would have seen that it, too, had come from Home Hardware. 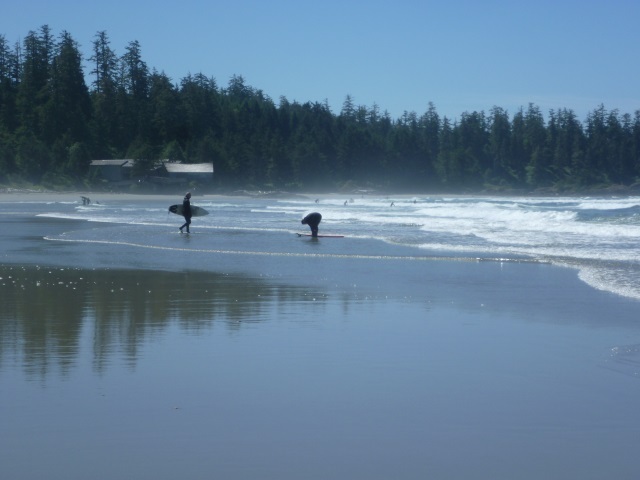 For our first full day on Vancouver Island, we decided to drive across the island to the shores of the Pacific Ocean. The drive was hot; British Columbia and, indeed, western Canada, has been experiencing a heat wave, with temperatures holding steady in the high 30’s and low 40’s C (high 90’s, low 100’s F) for a few weeks. 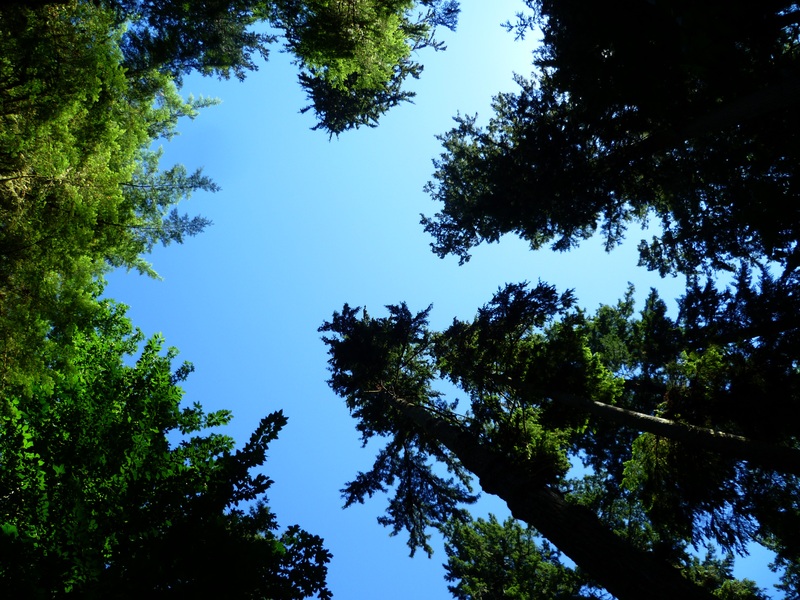 Vancouver Island is extremely dry and fires are a definite threat; the Pacific coastal rain forest hasn’t had significant rain in weeks, if not months. 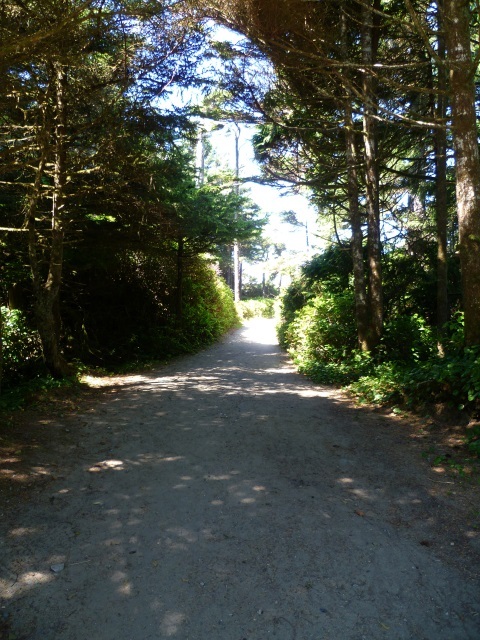 We encountered some construction along the route but we made good time, arriving in Ucluelet around lunch time. When you’re at that side of the island, you must, absolutely must, visit Long Beach. I love it there, and I know John does, too. The beautiful, sandy beach stretches for miles, as far as you can see. 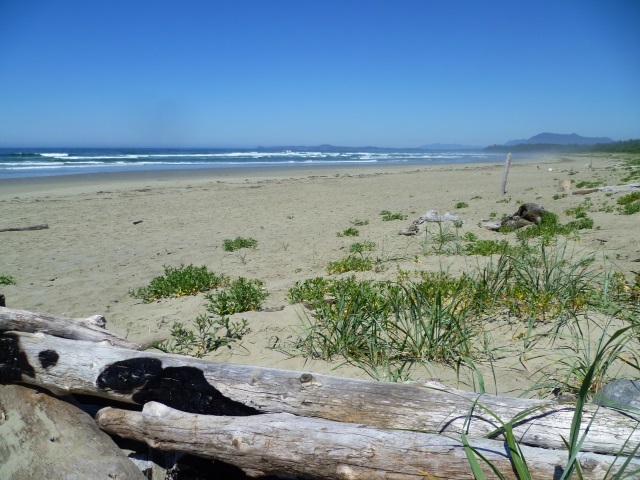 The Pacific Ocean… our first glimpse! The water was surprisingly warm and John took full advantage of it; he was the only person I saw who was swimming in the ocean, apart from the surfers who were suited up against the chill. I did go into the water but only about waist deep; honestly, I’m not much of a swimmer but I do enjoy being near the ocean. 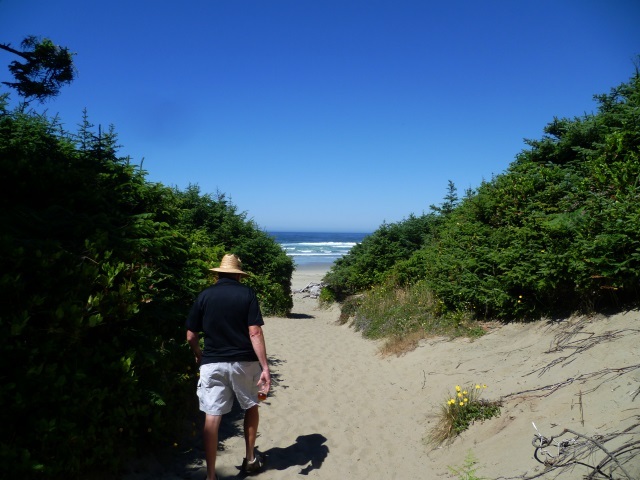 We wandered the beach for a while, just soaking it all in… until the sand fleas started biting. After that, we hotfooted it (literally! our feet were too sandy for our shoes so we walked barefoot; the sand was HOT!!) back to the car and continued our drive. 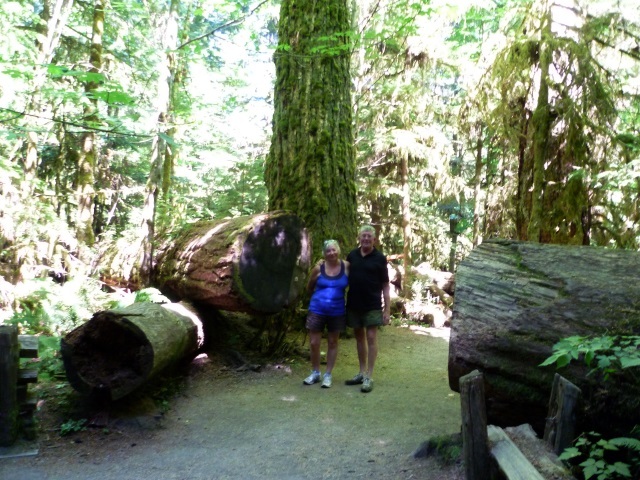 On the way back to Qualicum Beach, we absolutely had to stop at the world famous Cathedral Grove. It isn’t as I remembered it. The first time I was in Cathedral Grove, many, many years ago, it was a wild place; there were paths, certainly but no fences, no railings. 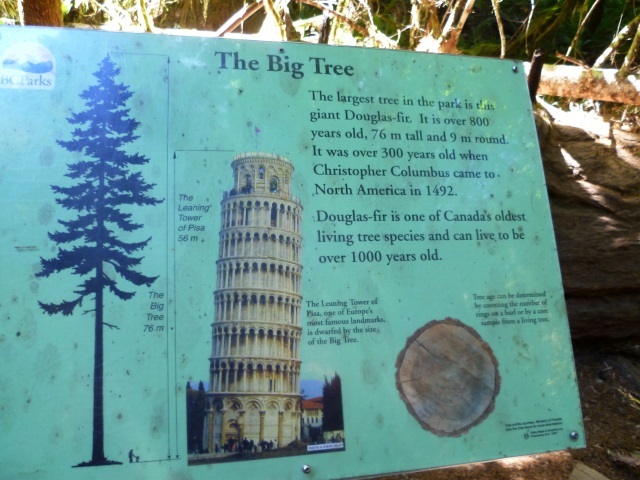 Now, there are parking lots on both sides of the highway; groups of tourists in tour buses stop to wander through the fenced paths and the wooden viewing platforms to marvel at the huge Douglas Firs. We didn’t stay long, just long enough to walk the paths, take a few pictures, have our pictures taken, and that’s about it. It does still inspire, though. Look up, waaaaaaay up! 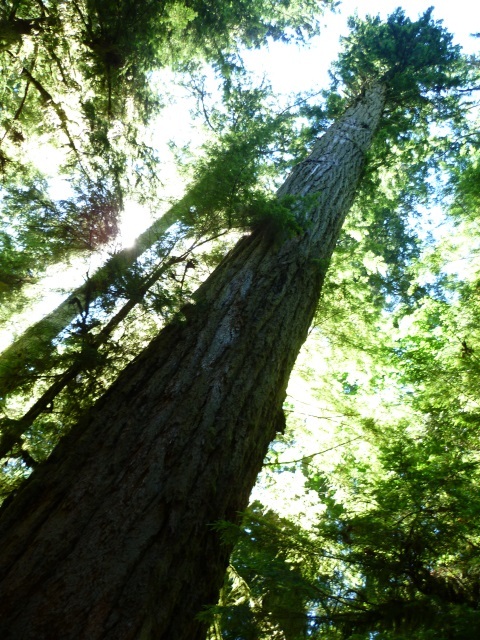 The tallest tree in Cathedral Grove. 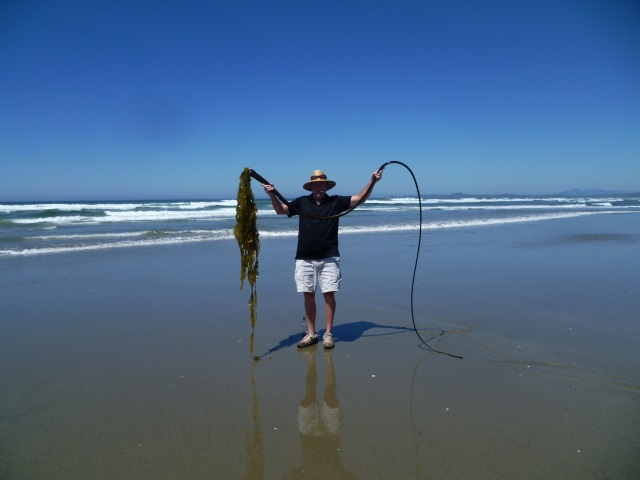 Once we left Cathedral Grove, we drove straight back to our motel to experience low tide. That was fun; it’s for another post, though. This one has more than enough pictures for one day.